Are spider bites dangerous? « Howard J. Bennett - Pediatrician and Author in Washington, D.C. Although a fear of spiders is on everyone’s top ten list of phobias, most spider bites are (a) not dangerous and (b) occur without the victim even knowing it happened. Because I’m a pediatrician, most of the spider bites I see happen to children. 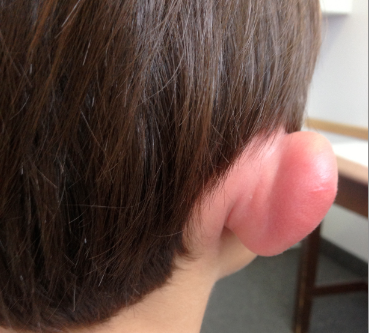 I have also noted that the ear is the most common place where these bites occur. (The above picture is one of my patients.) I’m not sure why this happens, but I’ve often wondered if it’s because the ear has a large, convoluted surface area that attracts the spider or gives it a place to hide. It’s also possible that the warmth of the ear attracts spiders. Spider bites usually occur when kids are outside playing or at night while they’re asleep. However, don’t worry that Aragog is stalking your children at night. (Aragog is the name of Hagrid’s spider friend from the Harry Potter books.) The spiders that bite people are tiny ones that are easy to miss even in the daytime. The typical spider bite presents as a red, swollen area that is warm or hot to the touch, but doesn’t hurt much. In fact, most of the time, they itch more than they hurt. The bites from black widow spiders and brown recluse spider scan be very dangerous, but in 30 years, I have never had a patient in this region of the country bitten by one of these species. Parents often give children Benadryl for spider bites assuming the child is having an allergic reaction to the bite. Benadryl doesn’t usually work because the swelling that accompanies spider bites is a local inflammatory reaction to venom rather than an allergy. However, Benadryl may help if the bite itches. The main first aid treatment is to put something cold on the area to reduce the swelling. My favorite remedy is a bag of frozen peas because it conforms to the swollen area. Kids who get spider bites are often treated with antibiotics because of a concern that the area is infected. Although this is possible, “garden variety” spider bites rarely get infected, possibly because the venom kills any bacteria in the area. If a spider bite is very swollen, oral steroids may help because they are anti-inflammatory medication. This entry was posted in Dr. B's Blog and tagged bites, medication.